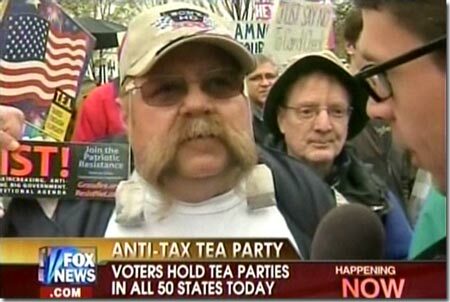 Dave Splash Dot Com: Who Are the Tea Partiers/Tea Baggers? Who Are the Tea Partiers/Tea Baggers? (from The Daily Beast, by Peter Beinhart) A new New York Times poll shows Tea Partiers are grumpy, older, well-off Americans who think white people are oppressed—in other words, Republicans. “Populist,” like “idealist,” is one of those words reporters use when they’ve checked their critical faculties at the door. George W. Bush routinely gets called an “idealist” in foreign policy because he gave soaring speeches on behalf of democracy. Whether his actions—in Pakistan, Saudi Arabia, Central Asia, the horn of Africa, or for that matter, Washington, D.C.—were particularly idealistic usually escapes scrutiny. He said he was for democracy, therefore he was. It’s the same with “populist.” Every time someone compares Barack Obama to Chairman Mao, the press garlands him with the word. But historically, the standards for what constitutes populism have been a little higher. In American history, populism has a specific meaning: It’s our non-Marxist way of talking about class. Being a populist means standing up for the little guy against ruling elites. Hating Washington isn’t enough, or else J.P. Morgan would have been a populist when he fumed that Theodore Roosevelt was busting his trusts. You have to be angry on behalf of the underdog. The Tea Partiers aren’t standing up for the little guy; they’re standing up to the little guy. We’ve long known that their leaders, like Sarah Palin, opposed against real regulation of Wall Street. Now we learn that what the Tea Partiers dislike about Barack Obama’s economic policies is that they don’t do enough for the rich. According to the Times, Tea Partiers are more likely than other Americans to think Barack Obama’s policies favor the poor, and they’re mad as heck about it. Not exactly William Jennings Bryan stuff. The Tea Partiers aren’t too fond of racial underdogs either. They’re more likely than other Americans to believe that the Obama administration favors blacks over whites, and that black people’s hardships have been exaggerated. America does have a history of right-wing, often racist, populism. Segregationist Alabama Governor George Wallace called his party the Populists in 1968. But at least Wallace’s economic views were reasonably progressive. The Tea Partiers favor the economically and racially privileged. They fail the populism test on both counts. So the press has a problem: what to call this intriguing new force in American politics? What kind of adjective suits older, grumpy, well-off Americans who believe Democrats are communists, the poor have it too easy and white people are oppressed? The term “Republican” comes to mind.